* Coreloft™ 80 (80 g/m²) insulation. Made with highly crimped multi-denier siliconized polyester yarn, this lightweight, breathable, and thermally efficient, 100% polyester staple fibre is very compressible and has excellent loft retention. Cerium LT Hoody - Mens is rated 4.1 out of 5 by 32. 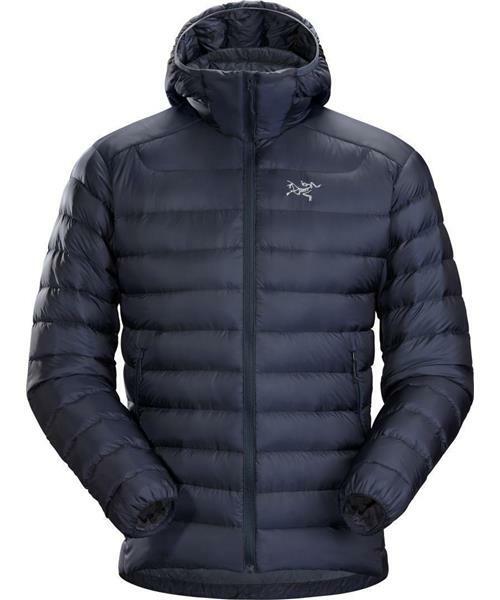 Rated 5 out of 5 by radi0head44 from Arc'teryx never fails As much as I love Arcteryx gear, I was weary about buying this jacket, being the company's first foray into the down market. But...my first time wearing this thing my concerns were all dispelled. It is incredibly warm for its weight, warmer than my MH ghost whisperer and only a couple ounces heavier. I'm 6'1, 180lbs and the medium fits like a dream. The fit is snug for layering purposes, but it's not at all restrictive in the arms or shoulders. The face fabric also feels much more durable than other ultralight down jackets I've tried out. I usually stick to Arc'teryx when it comes to technical jackets for my outdoor adventures and this purchase has reinforced that for me. Rated 2 out of 5 by Yukoner from Dissappointed I expected a great mid-weight layer jacket from a reputable company but got an expensive, underwhelming jacket. The issues: - poor distribution of down-fill around the waist (all was compressed to one side of jacket and none on other side) - No drawstring around waist so very drafty (there is elastic but too light to do anything) - threads coming out on front chest baffles (only casual use as underlayer - 4 months) - threads coming out on inside collar / hood area (only casual use as underlayer - 4 months) The good things about it: - high wamth to weight ratio (compact) - looks great I've owned both MEC and Taiga down-fill jackets and have been much happier with them. Rated 5 out of 5 by SackJhelburne from Best down piece I own. This jacket is AMAZING. I previously bought the Thorium AR and while it gave me that awesome down warmth, it was a little too boxy for my taste. I wanted something more trim fitting that flowed seamlessly between alpine pursuits and around town use. The Cerium fits the bill perfectly. It gives me that extra warmth I normally can't get out of my synthetics and it just feels great on you. Not having an elastic sinch makes sense, its a lightweight piece. The elastic hem does just fine. If you're looking into the best down in your quiver, I strongly recommend this one! Rated 5 out of 5 by robpizem from Nice I use this jacket as a back and forth to work and a fall climbing piece. I dont climb in it but wear it to warm up before and after climbing. It is lightweight which makes it easy to carry and has a stuff sack provided to pack it away. My first use there was however a climber above me who knocked off a large nearly fist sized piece of rock that shattered in half and hit my in teh shoulder and chest. After that impact from about 60 ft up was two tiny punctures that I sealed shortly afterward. If you dont fix those tiny holes you will loose down feathers with each movement. Rated 5 out of 5 by Ekram from Perfect jacket. I started running to work a year ago. I'd have my work clothes in my light 6L backpack. To go back home, I'd simply commute. This was great for the summer. I wanted to continue running in winter and didn't want to have a giant bag. I decided to go for a 12L backpack. I need to fit my work clothes and my winter jacket. I was happy to choose the Cerium LT Hoody. It fits into a pocket the best part is that I was able to use it down to temperatures in the -20C. I didn't have to wear more than a t-shirt underneath. I'm really happy with it and would recommend it any time. Rated 4 out of 5 by ep320 from Great fit but sheds feathers a bit too often A great fit, light and snug. However, surprised that every few days a few down feathers come out. Not sure what is considered normal with down jackets, but somewhat surprised. Had a few down jackets in the past and lost less down than with this one. Haven't yet used it for any winter activities so a bit worried how durable it will be. Rated 3 out of 5 by DanielK from Decent but flimsy Honestly I had really high hopes for this jacket as my first Arcteryx piece since I always stuck with North Face for the longest time. It did an amazing job of keeping me warm even when it was brutally cold outside and I'm the kind of person that gets cold really fast. I really loved the fit of the jacket and the minimalistic bulk of it. However after a week of two it started leaking down from the seams and I didn't pay much attention to it but every night or so I'd find random clumps on down feathers on my wardrobe floor so that sucked. Also, if there's a wind of any sort and no matter how cold it is, YOU WILL GET COLD. I ended up returning the jacket and getting the Kappa Hoody, I don't have to think a million times about whether I'll wreck it or not and It seems just as warm to me honestly. If Arcteryx could fix the build quality on this and try and fix the wind issue it would be a real killer jacket. Rated 4 out of 5 by JOPh from Nice entry into down I was really excited when Arcteryx finally announced their down jackets, and bought one this summer to use on a week backpacking trip in the Wallowas. Overall the warmth is good for the weight. Keeps me cozy down into the 30's with not much on underneath. The fit is pretty athletic, and this is the first Arcteryx jacket I've owned (of many) where I wished the sleeves were just a bit longer. The range of motion is pretty good, but an extra 1/2 inch or so would keep the sleeves from annoyingly pulling up my wrists when reaching both arms forward. The hood is nice and adds quite a bit of warmth. I always prefer the hoody versions of Arcteryx jackets because the collars on the non-hooded ones are so short (i.e. Atom LT) and don't give much coverage. The fabric is nice and I like that its not too glossy, typical great construction with high stitch-counts. Plan to keep this one awhile but hope Arcteryx will consider adding just a bit to the sleeves.